This is a cross post. To comment go to the official version on the Chron here. 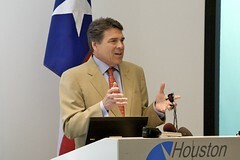 In 2006 Rick Perry passed an uneven business income tax in the state of Texas. This is in conflict with the Texas state constitution which states you can not have an income tax without a referendum. And for five years he has been able to get away with it. To the detriment of small business and preventing the creation of jobs in our state. It is not tax that breaks a business man’s soul. It is inequities. One of the first rules of business is “Never ever EVER mess with the government.” GangsterÂ Al Capone learned this the hard way going to jail for tax evasion instead of murder.Â I say this first to emphasize thatÂ I pay my taxes. All of them. Promptly. I collect sales tax and employee deductions and submit those promptly. And I pay them not out of fear of enforcement, but out of obligation as a proud American. Same reason I vote. It’s the right thing to do. So why this blog post then? Why poke the ant-hill? Because I read about this tragedy in Austin a few weeks ago. For some reason it really hit me hard. From the article. He offered his Louisiana cooking skills to the kitchens of places such as Gumbo’s andÂ Mama Roux. She brought her personality to the hostess stand. On Monday, they told workers they were going out of business. By Wednesday morning, they were dead. Police said they do not yet know a motive for the deaths. A Texas corporation listing Yoli Amr as the owner “” Dixie Roux Inc. “” had its charter revoked Jan. 28 for violations of the franchise tax portion of the state tax code, according to documents on file on the Texas secretary of state’s website. At a high level it sounds like their business, like many in our fourth year of recession here in the states, was having money problems. Sec.Â 24.Â Â PERSONAL INCOME TAX; DEDICATION OF PROCEEDS. (a)Â A general law enacted by the legislature that imposes a tax on the net incomes of natural persons, including a person’s share of partnership and unincorporated association income, must provide that the portion of the law imposing the tax not take effect until approved by a majority of the registered voters voting in a statewide referendum held on the question of imposing the tax. The referendum must specify the rate of the tax that will apply to taxable income as defined by law. The commission’s work culminated with a proposal to reform the franchise tax and for the state to buy down school property taxes. Working from the Texas Tax Reform Commission’s recommendations, Governor Perry called a Special Session in 2006 to address school property taxes. The commission’s plan was passed by the Legislature, and in May 2006, Governor Perry signed into law a package of bills that has provided tax relief of over $16.4 billion in school property taxes. In other words, toÂ reduce property taxes you must increase business taxes. Take $100 from Small-Business-Employer-Peter and give $10 each to Homeowner-Voter-Paul. OK, I get that. I’ll pay my share. But calling it a tax cut really galls me. …in a 2006 special session, engineering a tax overhaul that reduced local school property taxes. To help districts offset the loss of revenue, the Legislature revamped the franchise tax, increased the cigarette tax and modified how the state taxes used-car purchases. Perry signed the overhaul legislation into law in May 2006. A key goal of the new franchise tax, often called the margins tax, was to apply it to companies that had largely avoided the old corporate franchise tax. As expected at the time, businesses paid more in total after the overhaul of the franchise tax than before, although less than was forecast. Franchise tax revenue had totaled $5.8 billion in 2006 and 2007. In 2008 and 2009, the first two years of the revised tax, total revenue was $8.7 billion. Yes, you read that right. Business Taxes in Texas went from 5.8 Billion to 8.7 Billion looking at a two year period. Which by the way is less than was projected. So how do you explain the Franchise Tax law and why it is unfair? Well first because you can’t pass an income tax, they passed a “Margin Tax” where Government is going to classify each business and define how to calculate their margins. Um…. call me a skeptic but my experience has been government isn’t exactly an expert at defining the costs of running a business. For a grocery store the following are NOT considered valid costs of running a business. I repeat, these grocery store expenses are the ones that are NOT allowed. Cash Registers? What are we to do? Wander into an unheated warehouse with no employees with food stacked on the floor and leave money on the floor as we leave the building carrying half rotten food in our hands?Â So lets get one thing straight. The Texas Franchise Tax, called the Margin Tax, is in fact the Texas Business Income Tax with big government in charge of itemizing your Profit and Loss statement. Mom-and-pop auto repair shops across Texas are being forced into an unfair competition with big companies,Â dealerships and franchises that receive preferential tax treatment under state law. Texas requires incorporated businesses with more than $1 million in sales (in 2012 this figure rolls back to $600,000) to pay a business tax called the franchise or margin tax. Even though $1 million sounds like a lot of money, many small businesses fall into this category. The state provides different methods to calculate the tax based on the classification of businesses. Service industries use one method, retail businesses use another and trades such as plumbers and roofers use a third method. Which method do you suppose the auto repair business is required to use? The worst possible one. The independently owned auto repair shops in Texas are taxed at twice the rate applied to dealership-owned shops or franchise stores because of an outmoded classification system. So if I have my Chevy fixed at the local family owned repair shop, that locally owned business pays twice as much tax as if I had paid to have it repaired at the Dealership (do we still own GM?) I don’t know about you, but that just seems wrong to me. It’s cheating plain and simple and should not be tolerated. In business you have net profit, which is all of your sales minus all of your costs. This is what Corporations get taxed on by the Federal Government. It works pretty much like your personal taxes. Not everything is deductible so you always show more net profit on your corporate tax returns than you actually have at the end of the year (travel is only 50% deductible on the justification that you went to Odessa on business to party it up, but whatev…). So while someone may not like the Federal Income Tax, it is at least consistent. If it is bad, it is bad for everyone. Want more jobs? Give us a level playing field and leave us alone. I realize Atlas Shrugged isÂ puerile, but there are some truths in there. Get rid of the euphemisms. Speak clearly. Level the playing field. Then leave us alone. Regulate and tax us, but regulate and tax us fairly. You run the government and we’ll run the businesses and create jobs. OK? The Texas Franchise Tax, what I shall pin to the Governor who passed it as Rick Perry’s Texas Business Income Tax, is a huge business tax increase and it just isn’t fair to small business. It needs to be scrapped and fixed from the ground up. Send me a tax bill. Raise my taxes. Pass a fair income tax. Fine. I’ll pay them like I always do. But Texas, please send me the same tax bill you send the other businesses. That is only fair. Closing thoughts: In the course of writing this blog post I learned of the amazing work Yoli and Michael Amr did with animals. And read the heart felt comments on these posts. I am sorry I did not get a chance to meet them. In their honor I made a donation to Williamson County Animal Shelter. I also learned about some amazing resources to help entrepreneurs and anyone considering suicide. Don’t do it. We need you here. We really really need you here. Next PostNext iPhone Apps Make 4 to 6k Total?